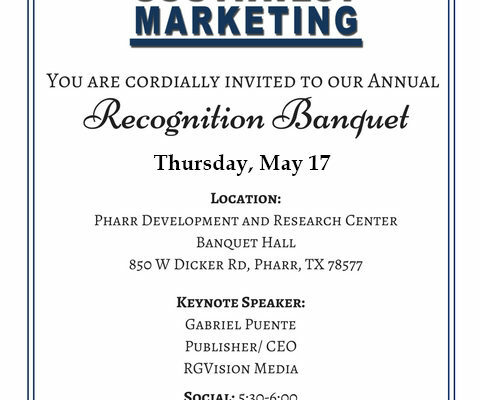 PSJA Southwest Early College High School’s Annual Southwest Marketing Banquet will be held on Thursday, May 17th at the Pharr Development and Research Center. 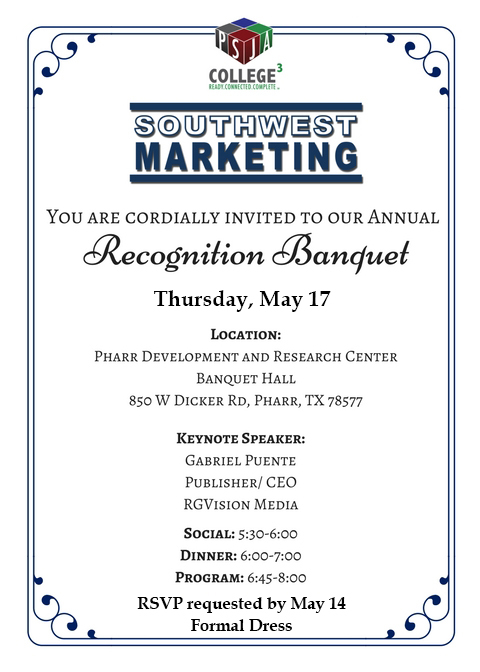 This has been a monumental year for the Southwest Marketing program and this banquet will allow PSJA Southwest to thank everyone who has contributed. Their willingness to mentor the students and provide true experiential learning opportunities is a testament to their civic and altruistic leadership. Mr. Gabe Puente of RGVision Media will serve as the keynote speaker for this event. His organization serves as an inspiration for what the marketing students are striving to achieve. Formal dress. Please RSVP by May 14th.